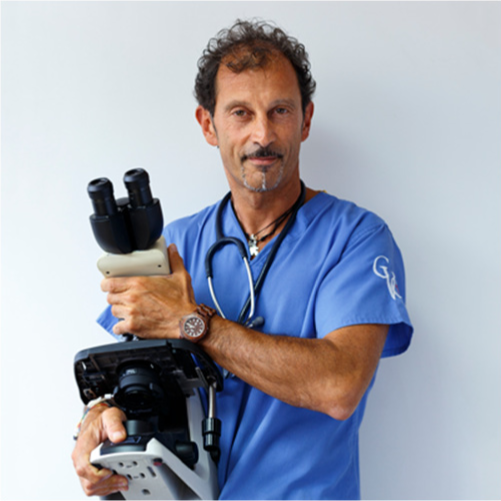 Dr. Francesco Carrani is a veterinarian and a specialist in clinic and pathology of small animals. Graduated in Veterinary Medicine in Pisa in 1992 with 110/110 result and a praise. In 1994 he obtained the specialization in the Clinic and Pathology of Small Animals at the faculty of Med.Vet. of Pisa with a thesis on "Acute renal failure in dog and cat, pathophysiology, diagnosis and treatment". He has attended numerous specialist courses in Italy and abroad on cytology, diagnostic imaging and oncology. Co-author of the Veterinary Good Practice Manual (ANMVI) joined the European Society of Veterinary Clinical Pathology, SCIVAC and specialist veterinarians of Cytology and Oncology. Since 1998 till 2017 he has been the Director of the 24-hour Cascina Veterinaria Clinic (Pisa) where he was mainly dealing with cytology, clinical pathology, internal medicine and diagnostic imaging. From 2003 he is an instructor in cytology courses in Italy and abroad and a speaker at international congresses. He is the author of the chapter "Skeletal muscle tissue cytology" of the book "Cytology of the dog and cat" and of some articles about cytology. He likes photography, fishing and picking mushrooms.